This holiday home, located on an exceptional position with a panoramic view over the bay, is real rarity in Istria. 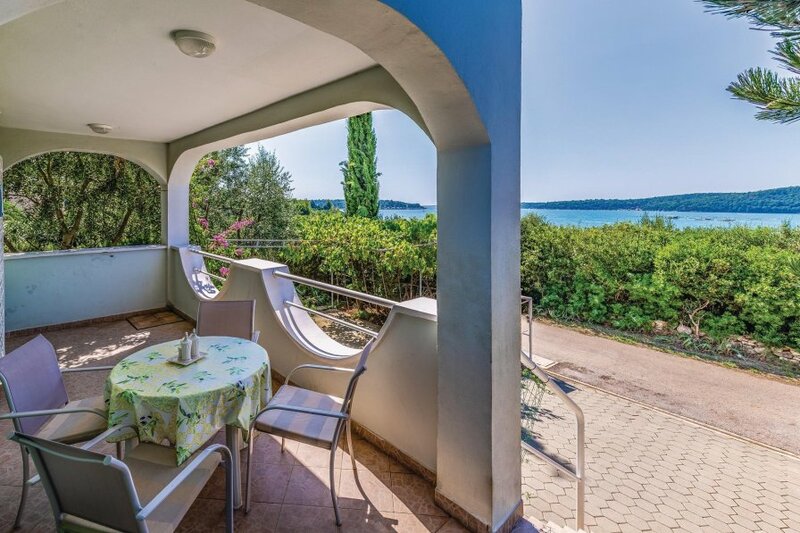 This holiday home, located on an exceptional position with a panoramic view over the bay, is real rarity in Istria. It is situated in the first row to the sea and therefore is even more attractive to all lovers of sun, sea and summer joys. The unit was created by joining two apartments, one on the ground floor and the other on the first floor of the house. The apartments are connected by external stairs. Each of the apartments has two bedrooms, a kitchen and a bathroom. In the upper part, the living room is air-conditioned. Both accommodation units have covered terraces with a sea view. The upper apartment has a view which will delight you. The interiors of this unit are fitted out in a simple and functional way and provide comfort during guests’ stay. From the side of the house there is one more terrace with a barbeque, which is at guests’ disposal. The plot is fully fenced so children can safely play on it. Near the unit, there is a path leading to the sea and natural (wild) beaches. In the bay, shells are grown which indicates that the sea is very clean there. This modern villa is made from brick or stone and was recently built in 2008. The agent has rated it as a three star property so it is a well-kept villa, equipped with standard furniture. It is also good value for money. This villa has beautiful panoramic view over water and is located in Pomer, only 10km from Pula. It is set in a very convenient location, just 70 metres away from a rock bound coast and 2km from a sandy beach. There's also a restaurant 1km away. The villa has free wireless internet. You can also park on-site at no extra charge. The villa is adequately equipped: it has a refrigerator and washing machine. It also has a barbecue and some garden furniture outside.